Aurora, Colorado theater shooter James Holmes gets 12 life sentences. 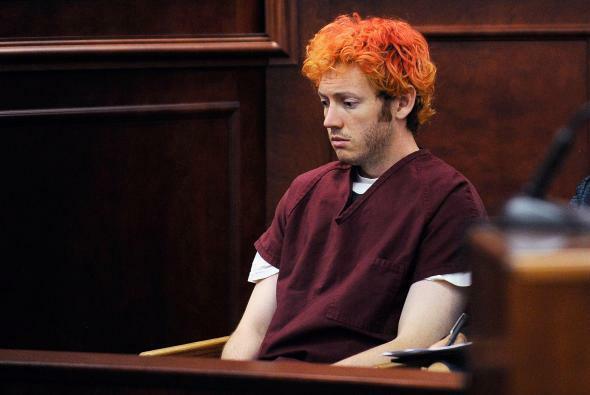 Accused movie theater shooter James Holmes during his first court appearance at the Arapahoe County on July 23, 2012 in Centennial, Colorado. A Colorado judge sentenced Aurora theater shooter James Holmes to 12 life sentences in prison for his 2012 shooting spree that killed 12 people and wounded 70 more. Last month, Holmes was found guilty of multiple charges related to the shooting after the jury rejected his defense team’s insanity plea. The same jury, however, did not impose the death penalty on Holmes as prosecutors were seeking. On top of the life sentences, Judge Carlos A. Samour Jr. tacked on another 3,318 years in prison for Holmes’ non-lethal crimes, the maximum he could impose. After reading the sentence, Samour made what the Associated Press described as a “contemptuous” final order, saying: “Sheriff, get the defendant out of my courtroom, please.” “Survivors and victims’ family members in the gallery cheered, and someone shouted ‘Loser!’ as deputies took Holmes away,” according to the AP.